On January 6th 2012, an excited and energetic team of MBA students from the Beedie School of Business (SFU) landed in Edmonton for the 2012 MBA Games.? The expectation of a frozen city dissipated as a warm Edmonton welcomed MBA students from across the country. Large Greyhound buses lined up at the airport uploading groups of the nation’s next great business minds and leaders. Although most participants were sleep deprived, one could clearly witness the adrenaline beating through everyone’s veins. 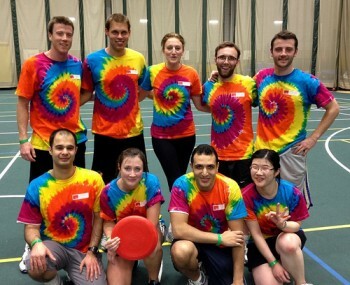 The MBA Games is an annual Canada-wide competition that brings together MBA students from across the country. The MBA Games originated at Queen’s University in 1988 and continued there until 1997. Since then, the MBA Games have been hosted at various schools. As a ritual, the MBA Games are held in the city of the reigning champion. Sunshine peaked through the clouds as buses dropped off herds of colour and clothing coordinated – representing different schools – groups of MBAs at the Westin Hotel in downtown Edmonton. The city seemed to have livened up with the newly arrived guests. The sounds of exciting cheers and laughter became great additions to the city of Edmonton for the weekend of January 6th to 8th. Let the MBA Games begin! The MBA Games involved academic, spirit, and athletic events, and opportunities to network with future leaders. SFU MBA students showcased a great deal of cohesiveness and team support throughout the games. “BEEDIE BEEDIE BEEDIE, S-F-U, BEEDIE, SIMON, BEEDIE, FRASER, BEEDIE BEEDIE BEEDIE, S-F-U!” As the team cheered loudly at each sporting event, they displayed significant signs of confidence and pride. As intimidating as the games were, the team worked together as one. It was apparent that not only did SFU bring its competitiveness, but also its value in friendliness. SFU students easily struck conversation with fellows from the opposite team, commenting and praising each other’s efforts. “The games were a fantastic experience! ?Our team did the Beedie School of Business proud with strong showings in the academic, spirit, and athletic events. ?Most importantly, we worked really well together as a team and showed hundreds of students from business schools across the country that the Beedie MBA is a world class program” said Lucas Mitchell, Team Captain for SFU at the games. Each night, social events offered opportunities for students to mingle with others under a more relaxed environment. Dancing and celebrating a day’s hard work, participants enjoyed each other’s company and what the nightlife the city had to offer. More than 500 people representing 19 schools across Canada competed in the games. Days began as early as 8am and schedules were jam packed with activities! Spirit teams travelled around the city of Edmonton using a 2-day transit pass given to everyone by the Games committee. Academic events were mentally challenging, as teams were given tight time constraints to package the best solution for the business problems presented. Sporting events were exciting; participants and supporters in these events made loud echoes in the University of Alberta. Faces of hope, smiles of joy, and eyes of anticipation, every participant was engaged in the spirit of the games. “We were amazed at the amount of skill at the sporting events. Not only did every team have talented athletes, but they were quality people as well. There were some amazing games and we were happy to have given some of the top teams a run for their money. I’ve never been prouder of any other team!” spoke Brian Peterson, an achieved athlete representing SFU. On the last day, every MBA candidate listened intently to the keynote speaker Court Carruthers eloquently express his interpretation of the theme of this year’s MBA Games – innovation and the future of technology. As the MBA games came to an end after many hours of conquering challenges and utilizing great minds to solve real business problems, the winning team led the crowd to the dance floor after dinner with one last celebration before concluding MBA Games 2012 in Edmonton. In retrospect, the games wouldn’t have been so amazing without the support of the members on the team. For the team from SFU, many students had lost their voice cheering on their teammates throughout the games. This experience will definitely last a lifetime. As many friendships were solidified, new buds of networks sparked throughout the trip. The city of Edmonton has made a great contribution as the backdrop for the amazing things that happened on this weekend.